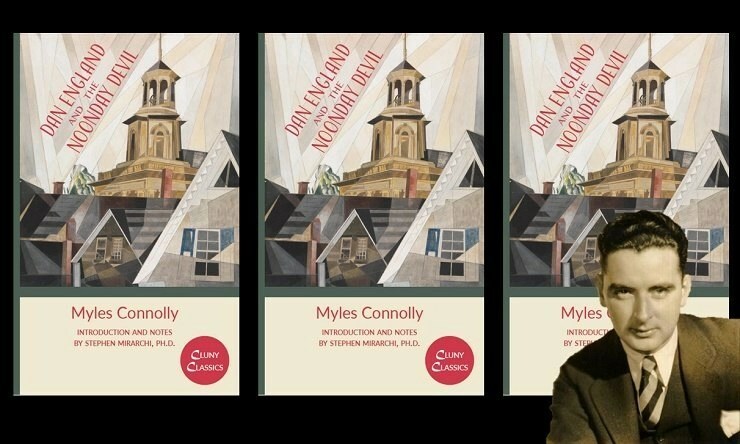 According to Myles Connolly (1897-1964), his favorite piece of his writing was not the acclaimed Mr. Blue (1928) nor even his Academy Award-nominated screenplay for Music for Millions (1944), but the third of his five novels, Dan England and the Noonday Devil (1951), which has recently been re-published by Cluny Media, with an introduction and notes by Benedictine College’s Dr. Stephen Mirarchi. It is a portrait of pedestrian holiness, not an interior biography of conversion (as Cluny’s last publication, Francois Mauriac’s Viper’s Tangle, was) but the external observation of a man who transformed others people’s lives through his charity and friendship, and whose own inner struggles bear fruit in the heroism of forgiveness. The outward exuberance of Dan’s tales during the red wine and red meat dinners with his motley assortment of friends and the inner conflicts he endures are the fuel of the novel, narrated by a journalist who first gets to know Dan through the positive transformation his influence has wrought in a colleague of his. Dr. Mirarchi’s helpful yet unobtrusive notes and insightful introduction (take his advice and read it when you’re finished the novel, since it contains spoilers) rightly underline the themes of the novel: the vocation of fatherhood (which Dan has seen himself too much of a coward for, but whose spiritual fatherhood of all around him is exemplary), true and loyal friendship (Aristotle’s “philia”) and how souls are slowly transfigured by close contact with holiness. As in Mr. Blue, one can see strands of Jesuit, Carmelite and even Franciscan spirituality. At one dinner conversation, Dan is asked by an agnostic friend (whom Dan has invited to lodge with him) what the Church is. The result is a five-page prose mosaic that left me having to explain to the woman on the plane seat next to me why I was crying. Dan England, like Christ himself, has a heart that suffers and a heart that embraces all he encounters with universal love. Myles Connolly has written a novel-length portrait of the towering strength of a soul whose weakness, in the world’s eyes, is charity. Myles’ daughter, Mary Connolly Breiner, writes a preface that highlights the similarities between Dan England and Connolly himself, whose after-dinner stories and chats with friends left her in rapt attention. Dan’s stories, which cover entire chapters of this 16-chapter gem, do the same. In Dan England, we see a bit of a George Bailey if he had never married. Connolly himself collaborated with his friend Frank Capra on It’s a Wonderful Life, and the sentiment “no man is poor who has friends” is widely echoed in the novel. But one also sees that only God can accompany man in his deepest struggles. This novel is a great example of how the best fiction can be spiritual reading, challenging us with characters who transform others by themselves being transformed, even when their humility goads them on never to rest on their laurels. May we never do so, lest we fall prey to the noonday devil. This appeared originally at Aleteia. Edward Mulholland Ph.D. is assistant professor of classical and modern languages at Benedictine College in Atchison, Kansas. He holds a doctorate in philosophy from Rome’s Pontifical Gregorian University, and an master’s degree in classics from the University of London. He has been involved in Catholic education via seminary, college and high school teaching for 25 years. He has taught in Italy, Spain, Mexico and the United States. He and his wife Valerie have six children.